"God is proud of what I have done," Mr Teitel said in court. Police called him a "Jewish terrorist" when he was arrested in October. His lawyer says he is mentally disturbed. "It's been a pleasure and an honour to serve my God," he said as he entered Jerusalem District Court. "God is proud of what I have done, I have no regrets." Police say Mr Teitel, a 37-year-old and father of four, has confessed to the 1997 murder of a Palestinian taxi driver in East Jerusalem and a shepherd in the West Bank, which he told them were to avenge suicide bombings in Israel. Putting poisonous antifreeze in three bottles of juice and leaving them near a Palestinian village in the hope of poisoning a passer-by. The charge sheet says some of the attacks were motivated by Mr Teitel's "hatred and objection" to individuals and groups whose lifestyles and ideology conflicted with his own. Charges include: Premeditated murder, attempted murder, weapons violations, arson in grave circumstances, incitement to violence and terror, threatening from a motive of hostility against a specific group. The judge said Mr Teitel would remain in custody until further notice, and further hearings would be held in mid-December. He was arrested in Jerusalem after he was found giving out leaflets in the ultra-Orthodox neighbourhood praising an attack on a gay youth club in Tel Aviv in August that killed two people. Mr Teitel's lawyer, Adi Keidar, at the time said his client was "mentally disturbed" and believed he was an "emissary of the Lord" who was instructed to carry out the attacks by God. 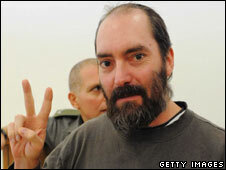 He said Mr Teitel had confessed to attacks he did not commit, and therefore his confessions could not be relied on.